These colorful African baskets are hand woven using plastic-coated wire and sometimes feature shimmering copper accents. These are incredible, intricately designed African baskets, some using accents of bare copper wire. 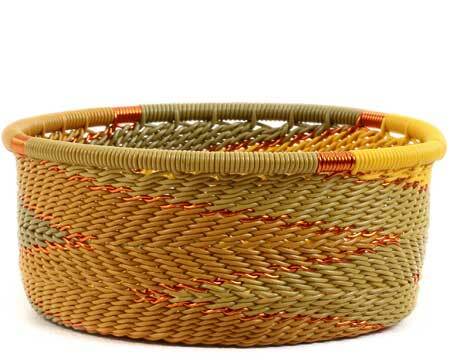 The past and the future are fused together in the creation of this beautiful basket. Zulu weavers have taken the intricate designs and incredible craftsmanship of their natural fiber baskets and turned them into brightly-colored art using plastic-coated wire.